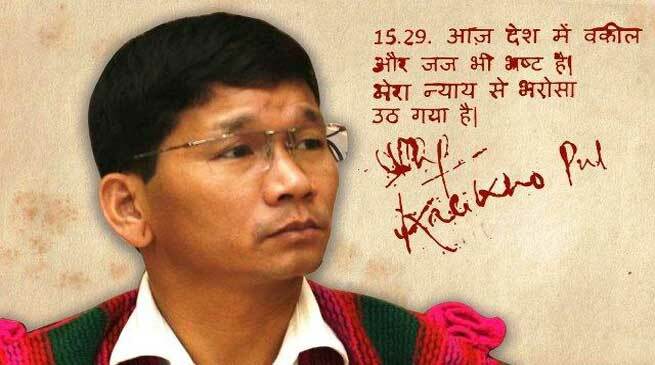 The Arunachal Pradesh government termed all the allegations made by former chief minister Kalikho Pul ” on his Suicide Note baseless and false”. Addressing a media conference here on Saturday , state government spokespersons Bamang Felix and P.D. Sona said the matter was sub judice and the state cabinet had “resolved to forward” it to the Union home ministry. They also said the government was open to any investigation. “The state cabinet after detailed deliberations without any prejudice to the matter has resolved to forward the matter to the home ministry for investigation by any agency they deem fit,” Felix said. Felix said Pul had made the observations without any “evidence and base” and nowhere in the notes did he mention the reasons for taking his own life. ” Mere Vichar is more of a biography,” Felix, who is also a minister, said, adding that the allegations need to be backed up by “evidence”. Sona, when questioned on the allegation made in the notes that he took Rs 4 crore from Pul, rubbished it. “I am open to any investigation as Rs 4 crore is not a small amount. The allegations made by Pul have no basis,” he said. On the allegations made by Pul’s first wife, Dangwimsai Pul, who claimed her family was being threatened by the state government, both Sona and Felix said she should make public the names of those who were threatening her. “The government will definitely provide Dangwimsai and her family the required security if they approach us,” Felix said. Dangwimsai had yesterday accused the BJP government in the state of trying to cover up the suicide note. It must be mention here that the wife of former Arunachal Pradesh Chief Minister Kalikho Pul, who committed suicide last year, has demanded a CBI investigation into his death. Pul left behind a 60-page suicide note alleging many irregularities and scams in the State. The letter names several political leaders and Supreme Court judges.